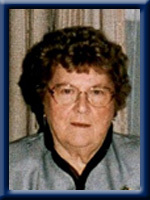 WAMBOLDT – Pauline M., 86, formerly of Port Medway, Queens County, passed away peacefully in North Queens Nursing Home on Monday, January 24th, 2011. Born in Devonshire, West Caledonia on August 12, 1924, she was a daughter of the late John and Annie (Coade) Carver. In her teen years, Pauline moved to Milton where she worked as a housekeeper and nanny for local families. She enjoyed dances, playing cards, going to variety shows and bus tours with her sisters and friends. She is a past member of the Women’s Institute of Nova Scotia (WINS), the Port Medway Fire Department Ladies Auxiliary and St. Gregory’s Catholic Church Ladies Auxiliary. Surviving are her son David and daughter in law Dianne of Milton. Daughter in law Betty Lou of Beach Meadows. Three grandsons: Adam (Erin) of Port Medway; Chris (Joanne) and Derek (Lori), both of Summerside, PEI; four great grandsons. Sisters Marguerite Holdright of Kempt and Althea (Tim) Rowter of Maitland Bridge. Many nieces and nephews. She was predeceased by her husband Paul, son Paul Douglas, sisters Jean Seldon, Beulah Cashman, Lurleen Carver, Zora Mills, Dora Mills, Helen Mooers and Mae McBride. Brothers Kenneth and Eddie. Offer Condolence for the family of Wamboldt; Pauline M.
We are very sorry to hear of the passing of my Great Aunt Pauline. Our thought and prayers go out to the Family at this difficult time. Our condolences to the Family at this sad time of your life. Please take courage from the reading of John 5:28.29. This promise will not fail. Our thoughts and prayers go out to Mrs.Wamboldt’s family-she was a lovely lady-who treated Stephen and I like family,when we lived next to her–in Port Medway–We both have a lot of wonderful memories,of the times we spent with her..She will be fondly remember by both of us–God bless and again we are very sorry to hear of your loss..!! So sorry to hear of Pauline’s passing. She was a lovely woman and will be fondly remembered by all that knew her. sorry to read about your grandmother,you guys take care and see you on the weekend. David, Dianne, Betty Lou and families: So sorry to hear of Pauline’s death. Our deepest sympathy to you, her family. I remember you, David, and your mother, father and brother from my childhood visits with my grandparents (Dessie and Everett Smith). Our family would come up for three weeks almost every summer. I am sorry for your loss. My Aunt Genesta and your mother were great friends! Dianne, Betty Lou, and families: We pray that time will ease your sorrow…May God bless! We are very sad to hear about Aunt Pauline’s passing. She was such a nice lady. Our thoughts and prayers are with you. David and Dianne::Our sincere condolences on David,s Mother,s passing. We didn,t know her but I,m sure she will be dearly missed by all her family and friends. Keep your memories close and she will be with you always. So sorry. Barb & Lloyd. Archie & Carol Guy, Margaree Valley, N. S.
David and Diane, please accept our deepest sympathy on the passing of your Mother. Our thoughts and prayers will be with you at this sad time. David & Diane, sorry to hear of the passing of your mother . Always keep your good memories of your mother in your heart and thoughts everyday. We are so sorry to hear of your Mom’s passing, our prayers are with you at this sad time. David ,Diane and Adam, so sorry to hear of your loss,I did not know her , John said she was a very nice lady., our thoughts are with you at this sad time. Sorry to hear of Aunt Pauline’s passing. Our thoughts and prayers are with you. Our heartfelt condolences. Haven’t seen Pauline in years, but she’s in a better place. I was surprised to hear of Pauline’s passing.I used to chat with her when i was walking sometimes,as she was always out in the summer doing something.I know we are related,but i didnt visit her,as was very scared of the dog,so then wasnt used to it.She was missed here when she went to the nursing home,but we all have to do it sometimes,as they need nursing help.I know you will miss her,but think of this,,she was well liked by everyone who knew her.and will be missed for sure.